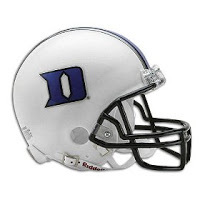 On a cloudy summer Saturday, the Duke Blue Devils will host the Florida International Golden Panthers at Wallace Wade Stadium at 290 Frank Bassett Drive in beautiful Durham, NC . September 1, 2012 is the date to remember. College football is always a wonderful way to start the drive towards autumn. Morehead Manor is a ten-minute drive to the stadium, making us the perfect stay-over for your Girls’ Football Weekend or a fun couple’s weekend. This entry was posted in Uncategorized and tagged Durham Events by admin. Bookmark the permalink.